This is the second book I have read in the last two months concerning the fear that robots and other machines powered by artificial intelligence will take over many professions in the next twenty years. Jay Richards’ book, The Human Advantage: The Future of American Work in an Age of Smart Machines, the author reminded us that there were qualities that humans have that can never be replicated by machines. 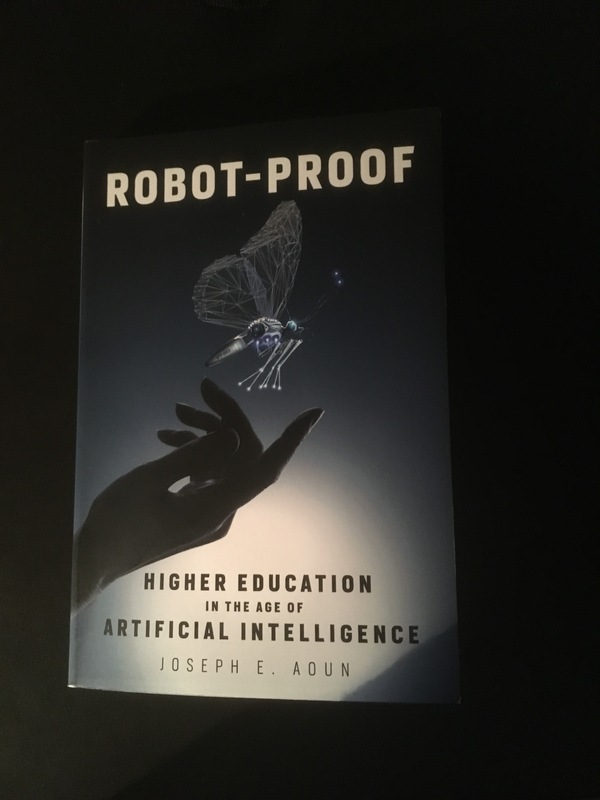 Richards is an educator and the same is true of Joseph E. Aoun, the author of Robot-Proof: Higher Education in the Age of Artificial Intelligence. As President of Northeastern University, Joseph Aoun advocates the need for a new curriculum called humanics. The study of humanics prepares students to work alongside smart machines. Aoun believes that humans have unique traits of creativity and flexibility and humanics helps today’s college students to develop these traits. It is easy to understand how the study of humanics can prepare students to be future-proof by considering its two aspects. The first aspect of humanics is comprised of three new literacies: data literacy, technological literacy and human literacy. The second aspect of humanics that student must develop are four cognitive capacities: systems thinking, entrepreneurship, cultural agility and critical thinking. With these literacies and capacities, we would be equipped to face the future of work assured that we could adapt even as work changes and smart machines become the best assistants we could ever imagine. Robot-Proof is a book that will help you to feel optimistic about the future. It will convince you that humans still have the edge over machines, even smart machines. It even convinced me that, as an educator of doctors, I had to begin to integrate humanics into my own teaching methods. If there is a genre of writing called “science fiction”, then Robot-Proof belongs to a genre that might be called science nonfiction.